A New York Times Bestseller! “Vicki Allegretti always wondered what it would feel like to look into the barrel of a loaded gun, and now she knew.” From the very first sentence of Devil’s Corner, Lisa, a New York Times bestselling author, launches an action-packed tale of murder and conspiracy set on the gritty streets of Philadelphia, but this time she departs from the halls of Rosato & Associates, and delivers a stand-alone thriller featuring a gutsy new heroine, Vicki Allegretti. When prosecutor Vicki Allegretti arrives at a rowhouse to meet a confidential informant, she finds herself in the wrong place at the wrong time—and is almost shot to death. She barely escapes with her life, but cannot save the two others gunned down before her disbelieving eyes. Stunned and heartbroken, Vicki tries to figure out how a routine meeting on a minor case became a double homicide. Then she sets out to see justice done. She can identify the killers—now all she has to do is find them. Vicki’s suspicions take her to Devil’s Corner, a city neighborhood teetering on the brink of ruin—thick with broken souls, innocent youth, and a scourge that preys on both. But the deeper Vicki probes, the more she becomes convinced that the murders weren’t random and the killers were more ruthless than she thought. Agreeing with her is her office crush, golden boy Dan Malloy—who is unfortunately too married to give Vicki the kind of support a girl really needs. When another murder thrusts Vicki together with an unlikely ally, she buckles up for a wild ride down a dangerous street—and into the cross-hairs of a conspiracy as powerful as it is relentless. 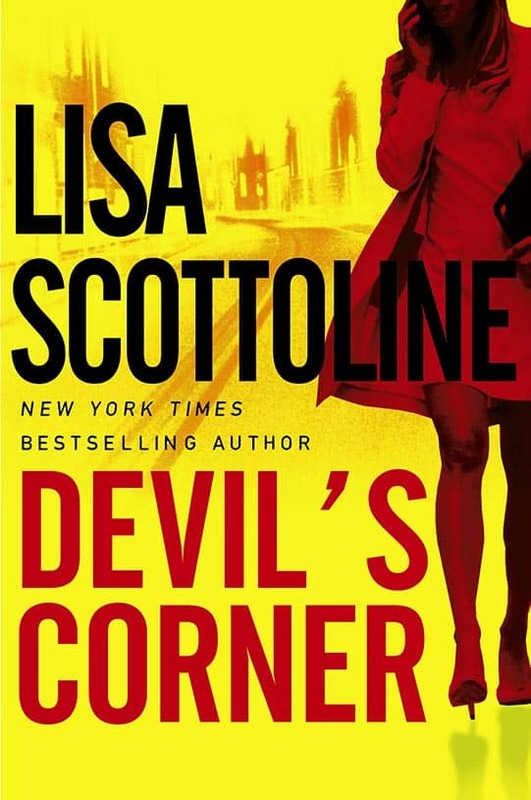 Set against the pulsing, real backdrop of a modern American city, with a storyline driven by the strong female characters and breakneck pace that has become her trademark, Devil’s Corner is Lisa most satisfying novel yet. Vicki Allegretti always wondered what it would feel like to look into the barrel of a loaded gun, and now she knew. The gun was a black Glock, nine millimeter, and it was aimed at her right eye. Vicki observed the scene out-of-body, as if it were happening to a girl with a better sense of humor. Wonder if black guns make you look thinner, she thought. Holding her point-blank was an African American teenager with cornrows, who looked as terrified as she was. He looked about fourteen years old, showing just a shadow of a mustache, and his brown eyes were jittery with fear. He kept shifting his weight in his big Iversons, standing tall in baggy jeans and a red satin Sixers jacket. He’d frozen in place when he’d come downstairs and found Vicki standing there, his shocked expression suggesting that he hadn’t shot many lawyers. At least not his share. “Wha?” The teenager swallowed hard, his eyes flickering with confusion. “Get your hands up!” The teenager’s eyes flared, and he wet his lips with a large, dry tongue. So Vicki did, holding her hands up, her thoughts racing ahead. None of this was supposed to be happening. She had come to the rowhouse tonight to meet a confidential informant in a minor straw purchase case. The meeting was to be so routine that Bob Morton, an ATF case agent, was finishing his cigarette outside by the car. Could she stall until Morty got here? And where was her CI now? Vicki noted the nickname. She could identify every zit on the kid’s face. She wasn’t getting out of this alive. She couldn’t wait for Morty. She had to do something. “Jay! Where you at?” the teenager shouted, half-turning away, and Vicki seized her only chance. She grabbed the barrel of the Glock and twisted it upward. At the same instant, Morty walked though the screen door and the whole world exploded. “Morty, watch out!” Vicky shouted. The Glock fired, jerking convulsively. The barrel seared her palms. The shot split her eardrums. The teenager wrenched the gun back, yanking her off her feet. Simultaneously, another shot rang out. Not from the Glock. Too close to be from Morty’s gun. Vicki’s throat caught and she looked past the teenager. A man in a goatee and a black coat was shooting at Morty from the stairs. “No!” Vicki screamed, grappling for the Glock. She glimpsed Morty as he fell backwards, grimacing with pain. His arms flew open like a marionette’s, throwing the gun from his hand. “NO!” Vicki screamed louder, as the shooter on the stairs kept firing. A second gunshot, then a third and fourth burst into Morty’s chest, exploding the blue ripstop of his down jacket, jerking his fallen body on impact. Vicki’s heart hiccupped with fear and she yanked harder on the gun. The teenager punched her in the stomach, and she doubled over, gasping for breath. She released the Glock and hit back. She connected with his Sixers jacket and held on for dear life. Vicki lay doubled over on her side, her body paralyzed with pain. Tears blurred her vision. She couldn’t collect her thoughts. She heard footsteps and panting, then a rifle chamber being ratcheted back. She opened wet eyes into the two bottomless black wells of a sawed-off shotgun. Hot smoke curled from the barrels, filling her nose with a burning smell. Aiming the weapon was the shooter with the goatee. My God, no. Vicki rolled over in a last effort to save herself. “Don’t do it, Jay, she’s a cop!” the teenager screamed. Then, “No! Get it! Hurry!” Suddenly they were scrambling to pick things up off the floor. Whatever they’d stolen must have fallen out of the Sixers coat. “Leave it go, Teeg! We gotta go!” The shooter was already sprinting away, his hands full. The teenager bolted after him, jumping over Morty and out the front door, leaving the rowhouse suddenly quiet. Morty. Vicki rolled back over and struggled to her feet, stumbling across the living room to him. He didn’t answer, his gaze barely focused. His neat features had gone slack and a sheen of perspiration coated his forehead and wet his sandy hair. Fresh blood gurgled from his chest and drenched his jacket, soaking its bright blue to slick black, spattering its exposed white stuffing with red flecks. “Thank you! Hurry!” Vicki pressed harder on the wound. Blood pulsed hot and wet between her fingers. Morty’s lips were parting. He was trying to say something. “Yes, I’m here, It’s me!” Vicki felt her heart lift. She kept her palm over the horrific wound. If anybody could survive this, Morty could. He was a fit forty-five year old, he worked out religiously, and he’d even run a marathon. “What the hell…happened?” A watery red-pink bubble formed in the corner of Morty’s mouth, and Vicki fought to maintain emotional control. “Funny. You always said…cigarettes will…kill me.” Morty managed an agonized smile. “You’re bossy for…a midget,” Morty whispered, then his smile suddenly relaxed. Vicki heard herself scream his name, then dropped the cell phone and tried to resuscitate him until police showed up at the door. Did you like Vicki, and are you happy or disappointed that the book features a new character instead of the regular girls at Rosato & Associates? Did anyone understand about the straw purchase? Did I do a lousy job making it clear enough? In case I did not make it clear, a straw purchase is when someone buys guns for the sole purpose of reselling them for drugs or cash. Do you think that drugs are a major factor in the decline of American cities? Do you think that we are doing enough to control drugs? Are we doing enough drug education, and does it work? How strong do you think is the correlation between drugs and crime? Do you believe in legalizing drugs? Do you think it would have a negative or positive impact on the crime rate? Is it fair to sacrifice a few innocent people to stop many crimes with projects such as Clean Sweep? Do we owe restitution to those who are unjustly accused? Did you like the girlfriend connection between Rehemma and Vicki? Do you think that two people from very different backgrounds can find a commonality for a lasting friendship? Do you think Dan and Vicki make a good couple? Do you think that people who work together should date? Do you think that Vicki crossed the line with Dan while he was married, even though they never had sexual contact prior to his wife leaving? Do you think that Vicki has finally earned her father’s respect? Why, even as adults, do we strive for our parents’ approval? Do you think that Vicki owed it to her father to join his law firm, or did she owe it to herself to follow her own path? Do you think that one or two people can make a difference and actually change a neighborhood around like Vicki and Rehemma? Do you think that there will ever again be a day when we can just send our children out to play, even in the wealthiest neighborhoods, the same carefree way our parents could? Along with the first sentence, Lisa imagined a brand new character, Vicki Allegretti, a tough-minded, gutsy and justice-inspired young assistant U.S. attorney, and the perfect fit for this wild ride through the grittier streets of Philadelphia. Devil’s Corner has as many twists, turns and surprises as the court case Lisa observed, and she hopes that you will learn as much about our American cities as she did that day in court.